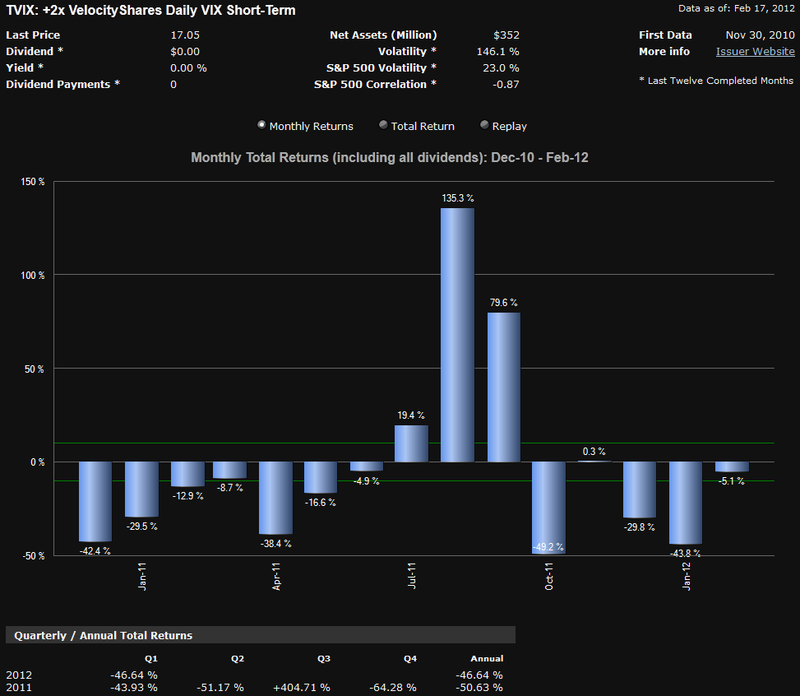 TVIX (VelocityShares Daily 2x VIX Short-Term ETN) is the new rock star in the VIX exchange-traded product (ETP) space. Far from being a one-hit wonder, I predicted just two weeks after it was launched (toward the end of 2010) that “TVIX will hit a tipping point and become the darling of day traders.” If anything, I am surprised that it took so long for TVIX to attract this much attention. Volatility – this seems obvious, but in the short-term, the movements of the front month and second month VIX futures explain almost all of the change in the price of TVIX. 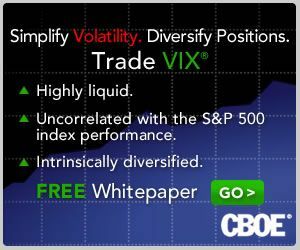 For day traders, TVIX becomes essentially a substitute for trading the VIX futures and with the exception of leverage, the other factors below are inconsequential. Leverage – another obvious factor, the 2x leverage in TVIX means that on average it moves about as quickly up and down in percentage terms as the VIX does and twice as quickly as a basket of front month and second month VIX futures. In the short-term, leverage means mostly that the moves in the underlying are exaggerated; in the long-term, leverage enhances volatility compounding and has a negative impact on price. Contango – thanks to the emergence of VIX ETPs as the cornerstone of volatility as an asset class, issues related to the VIX futures term structure in general and contango and negative roll yield in particular have become among the most frequently discussed issues in this space. Simply stated, the front month and second months of VIX futures are in contango more than 75% of the time, with the result being a monthly drag on TVIX’s price that exceeds the current annual yield on the 30-Year U.S. Treasury bond. Volatility compounding – the more volatility a leveraged security exhibits, the more that volatility will have a negative impact on performance over an extended period. The issue is the same as someone who owns a dress shop and marks the dress down 50% and then up 50% or reverses the chronology and marks the dress up 50% and then down 50%. Either way, the value of that dress declines by 25%. The same is true for leveraged ETPs and the degree of the price decay is a direct function of volatility. If you combine all four factors you have a product that is ideal for day trading, as it can skirt the contango and volatility compounding issues in a compressed time frame. For buy and hold investors, however, contango plus volatility compounding is a recipe for big losses. The graphic below lays out the gamble in visual terms. For the most part, those who are long TVIX for extended periods will be subject to losses that are substantial and persistent, but there is always the chance of catching a brief move in which all four forces are aligned with the bulls and TVIX moves sharply higher, as was the case in August and September 2011. Unfortunately, this is rarely the case. The bottom line is that if you are already invested in TVIX or are considering an investment in TVIX and do not fully understand each of the four issues above and their impact on investments in TVIX over the short-term and long-term time horizon, then it is probably time to stop trading and increase your knowledge base (hence the links below) before you learn some expensive lessons.